Peter Mullin, Chairman of the Mullin Automotive Museum, recounts the story of the “Million Franc” Delahaye. 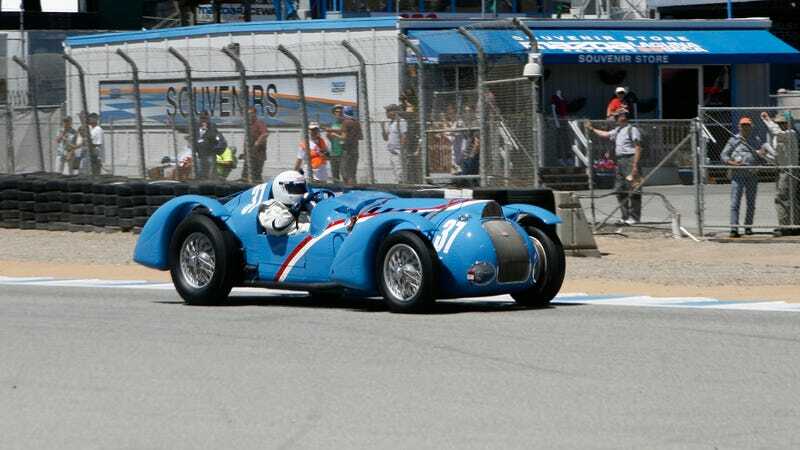 One of France’s most storied race cars, this 1937 Delahaye Type 145 won the Million Franc Challenge in 1937. The million-franc reward was posted by the Auto Club of France for any French manufacturer that could beat Alfa Romeo’s 1934 record for completing 16 laps (200 total kilometers, approximately 120 miles) at the Montlhéry Autodrome the fastest. The challenge was good through August 1937. The rise of the Third Reich and German nationalism had Hitler furiously backing the Mercedes-Benz Silver Arrow cars in a frenzied effort to overshadow French and Italian carmakers. The Delahaye campaign was financed by American Lucy Schell, and former Ferrari factory driver René Dreyfus was chosen as the Delahaye’s pilot. Dreyfus won the prize by completing the 16 laps in 1 hour 21 minutes: an average speed of 91.3 miles per hour / 146 kilometers per hour. The feat was a source of national pride in France. A few months later, Dreyfus and the “Million Franc” Delahaye defeated the Mercedes Silver Arrow team again at the 1938 Grand Prix of Pau. After Germany invaded France during World War II, René Dreyfus, who was Jewish, fled to America – where he ultimately became a renowned New York restauranteur. Hitler ordered that the Million Franc Delahaye be found and destroyed. Instead, the car was disassembled and its parts scattered to avoid German discovery. Four decades later, Peter Mullin painstakingly reassembled the car and documented its provenance. He tells the car’s story at the 2015 Monterey Historics. When the “Million Franc” Delahaye isn’t at car shows and vintage races, it resides at the Mullin Automotive Museum in Oxnard, California. GREAT SCOTT: Back To The Future DeLorean &apos;Hero Car&apos; Coming To The Petersen!